Tomatoes, Lycopersicon esculentum, are a long-standing favorite in the vegetable garden and gardeners have a wealth of choices when it comes to color, shape, size, taste, and growth habit. With a little planning, adequate water, and decent soil, a few plants can give you plenty of succulent produce. 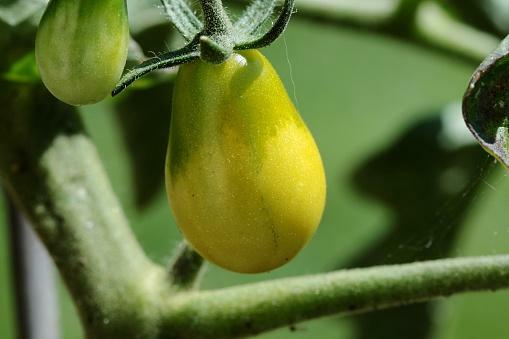 Technically a fruit, tomatoes produce small, pointed yellow flowers that are self-pollinating. Like other members of the potato family, it loves warmth and sun. Over time, varieties have been bred for the specific climate conditions of different regions. Hybrids have been developed for size, flavor, and disease resistance. 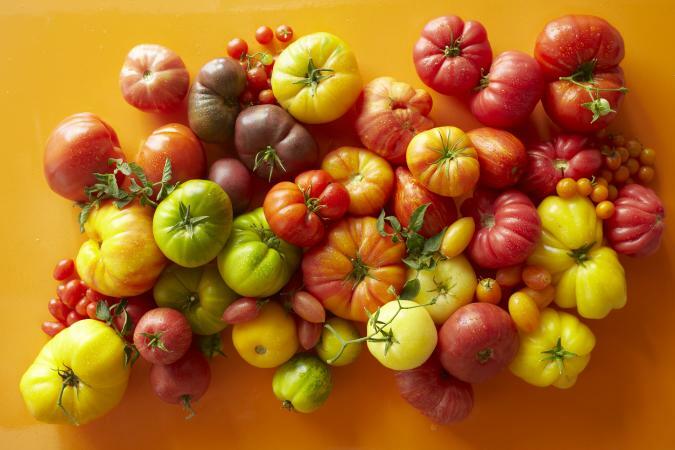 There is renewed interest in heirloom tomatoes, prized for unbeatable flavor, unique shapes, and beautiful colors. The plants have two types of growth habit. Determinate plants are bushy with one main crop of fruit, offering convenience to those who can, freeze or dry their harvest. The more compact plant is an advantage in small gardens and needs less staking. Indeterminate plants are vining and bear fruit continuously until a frost and require support with a tall cage or trellis. How long before you harvest your tomatoes depends on the classification. Early season types are ready in 40 to 60 days, mid-season varieties take anywhere from 60 to 80 days, and late season types take 80 days or longer. The seed packet or plant card attached to the tomato notes the days to harvest. Like most vegetables, tomato plants grow best in full sun, in well-drained soil enriched with organic matter. Plants grown in soils that have a tendency to puddle will develop rot and die. They require regular watering, and during hot weather, need daily applications. Tomatoes are great candidates for container gardening and some varieties are suitable used in hanging baskets like the cultivar 'Tiny Tim'. Choose a container that holds at least 3 to 5 gallons of soil and has drainage holes in the bottom. Be aware that containers can dry out quickly and plants may require daily water applications. Cherry and early bearing varieties are easy to grow in pots when space is limited, but just about any variety will work. Tomatoes can be grown from seed or bought as seedlings in packs. Before planting outdoors, wait until the ground warms and all danger of frost has passed. 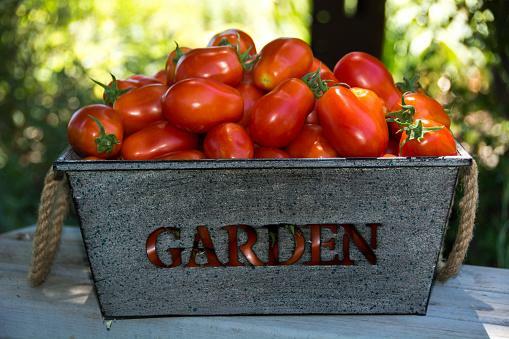 Depending on your local climate, it's suitable to plant tomatoes in spring, summer, and fall. For those wanting a head start, start your seeds indoors four to six weeks before the last frost. Fill peat pots with a potting mix and settle the soil by adding a small amount of water until it's moist. Plant one to two tomato seeds 1/4-inch deep in the middle of each pot. Moisten the soil again. Place the peat pots in a warn location that receives sun most of the day such as a kitchen window. Water when the soil feels dry to the touch and the seeds to sprout in approximately five to 10 days. Plant your tomato transplants a bit deeper than they are growing in the container. This allows the plant to develop a sturdier framework. Space multiple plants 2 feet apart. This allows adequate circulation of air, which cuts down on problems with diseases. 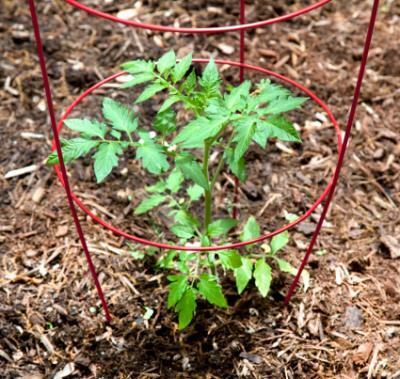 Provide some sort of support for your tomato plants as soon as you plant them such as a wire cage. This reduces damage to the roots. Using a cage keeps fruit and leaves off the ground and away from soil borne diseases and plants takes up less space. Wayward vines can be pruned off or tucked into the wire frame. Some gardeners prefer tying each vine loosely to a wooden stake as it grows, using strips of soft cloth or pantyhose. Tomatoes are susceptible to various problems, such as pests, funguses, viruses, and leaf spot diseases. Avoid most problems by taking preventive measures, such as choosing disease resistant varieties and practicing good garden hygiene and growing habits. Don't grow tomatoes in the same location where they grew the year before, or where other members of the Solanaceae family grew, such as eggplants or potatoes. Mulch around plants to prevent soil splashing, and water with soakers hoses instead of sprinklers or overhead methods, to prevent problems with disease. Once the tomato plant has finished producing, remove it from the garden and clean up planting area. Toss any diseased plants out, not in the compost. Use companion plants like marigolds to discourage unwanted pests and plant directly around the tomatoes. If you smoke cigarettes, don't touch the tomato because you can transfer the tobacco mosaic disease to the plant. Thoroughly wash your hands before handling. If you notice pests such as tiny sap-sucking aphids on your plants, spray the entire plant with an insecticidal soap. It's friendlier to the environment and local pollinators. If left unchecked, tomato hornworms can devour a tomato plant in several days, ruining your crop. 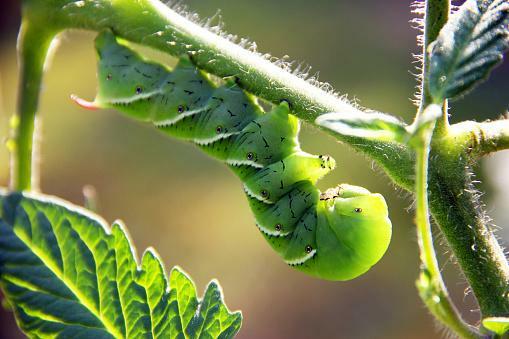 These big green caterpillars turn into a moth and with their ability to blend in with the foliage, half the plant might be stripped of leaves before you notice a problem. Dark droppings on the foliage is a sure sign of a hornworm problem. If you don't want to sacrifice your hard work to the local ecosystem, getting rid of the pest is as easy as picking them off the plant and dropping the caterpillar into a bucket of soapy water. If outdoor temperatures rise above 85 - 90 degrees Fahrenheit or conditions are extremely humid, tomato plants stop setting fruit. Keep the plants growing healthy until favorable conditions return. 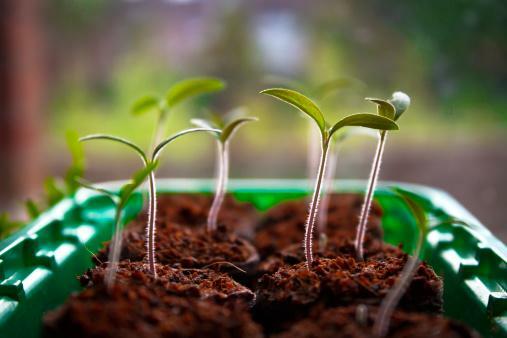 Remember that stressed plants are more vulnerable to pests and diseases, so regular watering, proper spacing, and healthy soil help protect your plants. It's easier to keep tomato plants healthy than trying to treat a problem once it rears its ugly head. Gardeners have hundreds of tomato cultivars to choose from, whether you are looking for an indeterminate or determinate type, there's something out there for everyone. You can locate different varieties at your local garden store or online seed companies such as Bonnie Plants or Burpee. Besides tasting good, tomatoes have everything going for them when it comes to their nutritional benefits. For those counting calories, a 100-gram (medium-sized) tomato only has 18 calories, making it a low-calorie food and contains no fat. Tomatoes also are an excellent source of vitamins C A, and B-complex, plus minerals such as potassium, antioxidants, and dietary fiber. Scientific studies show that the antioxidants in tomatoes help protect against certain cancers, such as prostrate, breast, colon, and lung, as well as tumors of the pancreas. 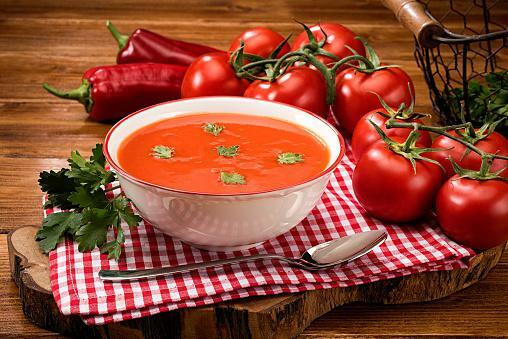 Cuisines around the world use tomatoes in their recipes as a flavorful main ingredient. They are versatile in their use in the kitchen, utilized in everything from jams, sauces, soups, stews, condiments, and spice up various casseroles, pasta, meat, and vegetarian dishes. Tomatoes are also tasty sliced fresh and used in salads, salsas, appetizers, sandwiches, or eaten with a touch of salt and pepper. Whatever way you prefer, tomatoes add a finishing touch to tasty recipes. Tomatoes are a staple in gardens and kitchens around the world and are relatively basic to grow provided their preferred growing conditions. With so many selections, there's bound to be a tomato to fit your taste and growing needs.